The healing properties of stones have been recognized and implemented in ancient treatments. Over the centuries, more and more people started using crystals in order to protect and strengthen their soul. Long before modern medicine began its development, stones and crystals were used by spiritual leaders, as well as healers in fight against severe diseases. Worshipped by many tribes, well-hidden from strangers’ eyes and their potential harmful energies, stones and gems were part of our ancestor’s everyday life. This belief in the healing properties of stones has been forgotten and would’ve stood in a dark corner of holistic medicine had it not been for the new wave of spiritual leaders. Nowadays, working with stones to heal and not only to use them as fashionable accessories, is a must. This opening towards spiritual practices is synonym with today’s wave of esoteric people trying to connect with their past, with their ancestors and to find spiritual guidance. Human beings consist of two parts: the outside (or the body), which is the shell, and the spirit, which animates the shell. Considering this theory as a true fact, it’s not hard to understand that if one of the two suffers, then both of them will suffer equally. This is the theory of the human balance, according to which, if a part of our existence has a problem or is highly unbalanced, then the whole system will suffer. And here comes the part where we need stones. Whenever these malfunctions occur, stones can redirect the unbalanced energy and make it flow normally. Pretty cool, right? To ensure that the healing properties of stones are not altered, you must regularly cleanse your gems. Cleansing is no easy thing to do, and it can take from a couple of minutes, up to a few days. 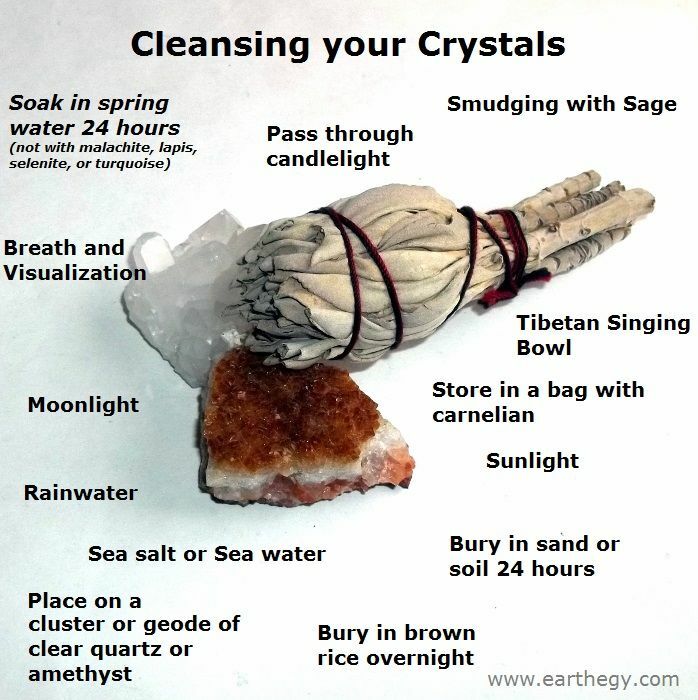 Whenever you feel your crystals, or your gems have become dull, try to clean them and then use them again. By cleaning your gems, you increase the effects of their metaphysical energies. Believed to gave extensive memory, stones must be periodically cleansed of any unwanted energies that they may have collected over time time, from you, from others, or from the environment. Sometimes stones take the pain or the emotional problems of the people touching them. During your meditation, you need to charge your spirit with positive energies, and not with other problems. When a stone has absorbed negative energies, there is a slight chance that the rock will stop working well. How can you cleanse a stone? Use the natural elements that surround you. Fire – Light a candle, and carefully pass the stone through the flame until you feel it has been cleared. Get in contact with your stone and fulfil its needs to know exactly when the fire managed to purge all the negative energy. Smudging – burn some white sage and carefully pass the stone through the smoke, until you feel it has been cleansed. Water – rinse the stone in moving water (hold the stone in a river for several minutes, leave your stone out in the rain, or hold it under running water for several minutes). Earth – bury your stone in the ground for a full day. You may want to place something on top of the place where your gems are. Use normal soil and a natural ground. Placing your gem in a flower pot won’t lead to its cleansing. For stones, the ground feels like home, as it is where they formed and grew. Sea salt – or cleansing stones with water and sea salt. Place the the stone in a bag and rinse it in the ocean for several minutes. Anther option would be to simply soak the stone for several hours in a glass of water with a pinch of sea salt. Simply placing your stone in salt is a very bad idea, that will probably lead to the destruction of your gem. Please do not do it. While meditating, or while using the stones for medical purpose, you need to feel a positive vibration. Try, if possible to keep your stone away from your friend’s hands. Everyone wants to touch them, but when in touch with the energy of another person than their owner, stones tend to accumulate all the negative energy that those people have – a harming energy that interferes with the owner’s chakras. Regarding stone healing, there are various ways for you to carry one. Depending on the shape and type of stone, certain stones can be put on the affected area, and on certain parts of the body. One of the most common way of using stones with healing properties is by wearing them as jewelry (rings, earrings, pendants and many others). The almost magical healing power of stones is strongly connected to the idea of Chakra healing and finding the right balance between the body and the spirit. Healing stones are an excellent supplement in the treatment of psychological and physical troubles such as depression, stress, insomnia, headaches, traumas and even cancer. Important: All healing stones come to supplement already prescribed medical treatment. Stones are used more as spiritual supports to healing, so there’s no wonder that your doctor has never prescribed any crystals to you. Depending on the outcomes you hope to achieve, there a number of stones you may want to wear. From Amethyst to cobalt and lapis, all stones have at least one medical use that can be maximized by simply wearing a small, nice fashionable piece of jewelry. By purchasing different stones or different beads made out of stones, you can create your own piece, especially designed to have all your desired properties. Lapis lazuli, opal and topaz would make an excellent piece for a creative person that wants to enhance his or her inborn qualities. Also, you may want to wear some bloodstone jewelry to prevent or to cure anaemia, and some fluorite to boost your immune system. When it comes to stones, the possibilities are endless. To make healing jewelry, you can either purchase raw gems or their already polished versions. Combine, read more about the stone that you are interested in, and let your imagination take over. By doing this you will be assured that you have the right jewels and that the results of your DIY projects will also carry your energy. If you’re looking for something nicer, with balanced colors and refined details, you may want to contact a specialist in the field. If you want to learn more about the healing properties of stones, we invite you to browse or blog, which contains tons of information about chakras, spiritual stones, handmade jewelry and more. Hey Buddy!, I found this information for you: "The Healing Properties of Stones". Here is the website link: https://accessgems.com/healing-properties-of-stones/. Thank you.